Ra230 Fort de la Cite d'Aleth. Outside the wall. K.V.U. Gruppe Festung St Malo, K.V.Gruppe Rance. 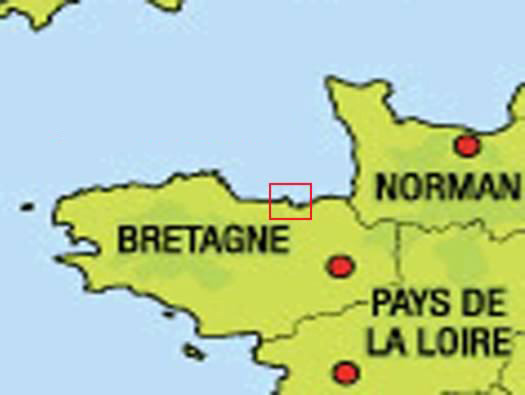 Ra230 Fort de la Cite d'Aleth. Outside the wall. Ra230 Fort de la Cité d'Aleth. The old French defence of St-Servan-sur-Mer and the left flank of Saint-Malo. A very old defence probably upgraded by Vauban and then by the Germans into the main defence of Festung Saint-Malo. From Armuria : Le Passe en Miniature. Ra230 Fort de la Cité d'Aleth. A nice walk from Saint-Malo town across the lock and around the bay at Les Bas Sablon to the yacht marina (Port De Plaisance des Sablon) and then climb the steps up to the fort. 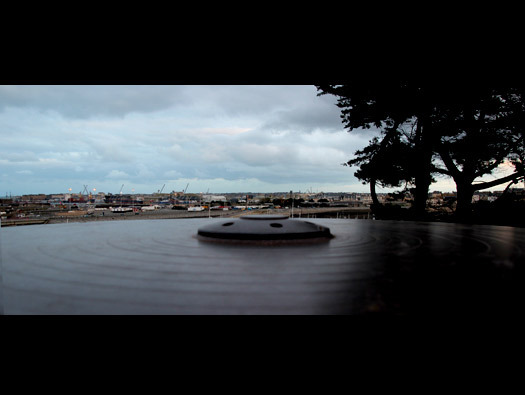 Also you can drive through the old roads through St-Servan-sur-Mer and park at the yacht marina. On all my visits I have walked the perimeter and the came back through the main gate and on to the port. The iconic view of the fort. A colour photo of the ruins of St-Malo. Oberst Von Aulock commander of Festung Saint-Malo. Plan of Ra230 Fort de la Cité D'Aleth. 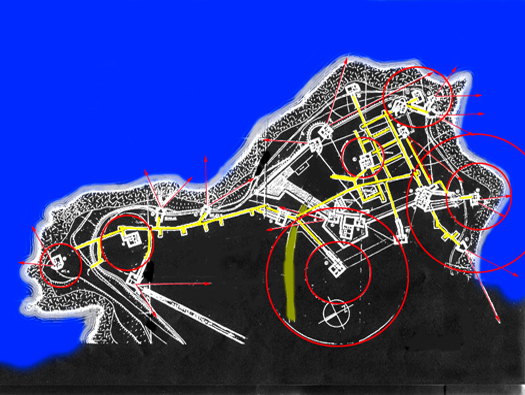 The plan of layout of the fort showing all the bunkers in white and in yellow the underground (souterrain). In the summer you can tour the underground areas and Museum. Each bunker is numbered with Z. followed by its number. 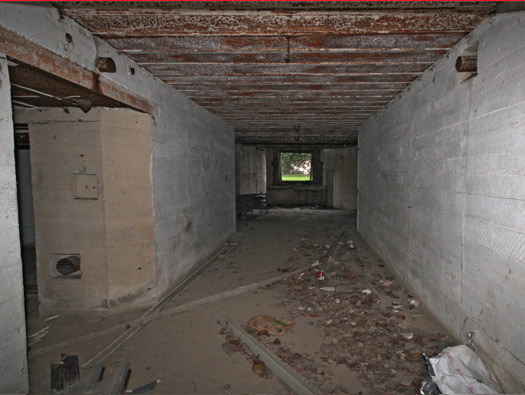 The bunkers used were adapted to being attached to an underground system by leaving out their close combat rooms. Z.10 114a neu bunker with a 20P7 cupola. The dome (cupola) has six embrasures to locate a machine gun in and a periscope in the centre of the roof. The battle to take the fort was hard and bloody as you can see from the damage done. 114a neu 6 embrasure turret. Machine gunner inside a 20P7 dome. Inside a cupola, not a lot of room. An MG 34 was used in here. Underneath this cupola is an R114a neu bunker with a crew room, a gas lock & entrance and the cupola and here it was linked to an underground network of passages which attached most of these bunkers together into a very strong defence. Z.18 R105d/105c/M.G. - Stand S.K. 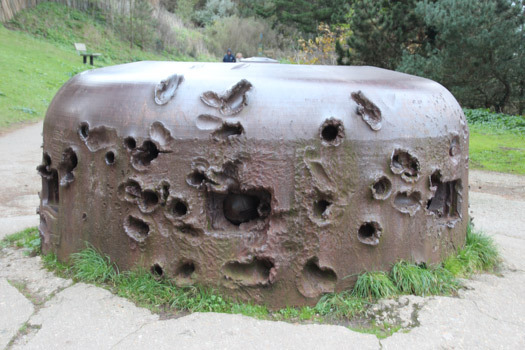 This is the bottom of Z.18 and shoots along the forts east wall. R105d/105c/M.G. - Stand S.K plan. The original French fort wall. Z. 10 R112b Bunker with a 20P7 cupola. A slightly larger bunker using the same type of cupola this time covering the northern side of the fort with cross fire from both cupolas either side. R112b bunker slightly larger than the last bunker R114a with added ammunition room and a store room and a larger crew room and around eleven men would man this bunker. A periscope came up through the centre of the cupola and the officer in charge of the bunker could control the battle from there. This one really did take some hits and is the famous one with a shell still embedded in the metal. R112 plan here with the close combat room not built and a passage to the underground tunnel system. And this is the one. Imagine what it must have been like inside. Z.10 R112b bunker with a 20P7 Cupola. The periscope would come through the top of the cupola. Blanking plug to close off the open embrasure. Z.22 an R636 command post for coastal batteries. This command post must have had a battery of guns inland to fire on the coast. R636 plan with crew room, centre computing room and the three rooms at the top officers, com's. and wireless..
Z.20 R611 Casemate with 10.5cm F.H.18 Guns. Below the Cupola and its R112b bunker is an R611 casemate. This one is at Ra155 Ville es Mesneir, 'Battr. Kahlenbach' and this shows how it would look down there. In a normal 611 the left hand side would have been two ammunition stores (case & shell rooms) here it is connected to another fighting room an R667 casemate and behind would have connected to the underground passage. Plan of the area below the fire control 636. Top 667, bottom 611 & behind 112. Z.12 R112 six embrasured turret bunker. R112 set into the rocks and attached to the underground tunnel system. Two bunker specialists (well spotters) discussing the weather and disinterested locals walk by and ignore us. The turret this side is perfect no damage at all. This looks to be a 40P8 cupola. 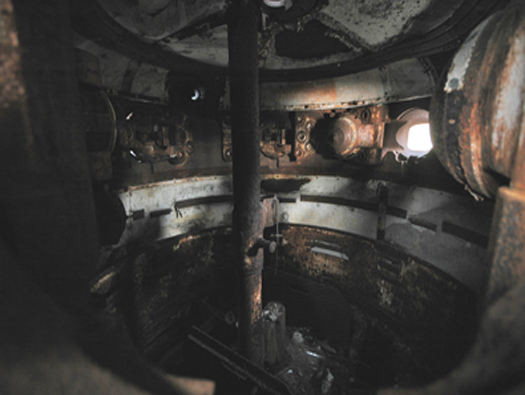 The turret inside with he periscope tub in place and the embrasure plugs to close off the aperture hinged open. This looks to be a 40P8 cupola. 8192E1 blanking plug in place. Steel ball joint to hold an MG34 machine gun. 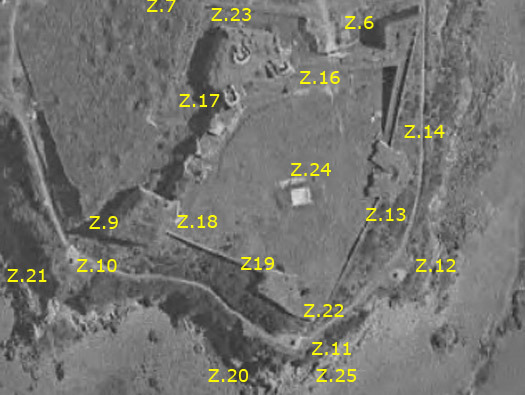 The Z numbers of bunkers around the fort. Z.13 an R105b machine gun emplacement. Covering the fort wall this gun could sweep the wall and bank with machine gun fire against attackers. R105 plan with a machine gun behind a 78P9 metal plate. A 78P9Pz.-Schartenplatte for a MG.34. Gun room with a heavy double steel door and an anti gas filtration unit on the wall. Air would be drawn in via a tube and drawn through an anti gas filter and then allowed it over pressure the gun room thus not allowing the gas to get in. Also there was an ant smoke filter that could be used when just smoke was a problem. This is the area that the machine gun covered, the trees would not have been there. Z.14 an R105b machine gun emplacement. Now this is the same bunker but facing the other way. A closer view of the 78P9Pz. Schartsnplatte for an Mg34. 78P9Pz. Schartsnplatte for an Mg34. Possibly an original French gun casemate and damage on the old wall. Z.5 R625 casemate for a 7.5cm Pak 40. This casemate is designed for a 7.5cm Pak 40 anti-tank gun, ideal to shoot at shipping by hitting low on the water line to sink them. R625 Casemate for a 7.5cm Pak 40 fitted into the rock face. Z.4 R625 casemate for a 7.5cm Pak 40. This is the second Pak bunker. I think this may be a small ammunition bunker? One of the two entrances into the tunnel system. Z.1 R112 six embrasured turret bunker. This one has been shot at from the town. Z. 7 R114A neu six embrasured bunker. This 40P8 cupola covers the back of the fort. R114A neu attached to the underground passage. Z.17 105d/105b two levels of bunkers. Two very large steel plates set into a mix of bunkers and old fort and set into the Keep and able to shoot across the moat. Damaged wall and a door. With this door they could access the moat from the main fort. Still with all its fittings here. Z. 5 R504 antitank gun garage. The gun could be drawn into the garage side and the crew could use the other two rooms, Ammunition was stored underneath the gun. Built into the old Keep of the fort are three bunkers on several levels with tunnels and steps connecting them. This view shows how much damage was done by the heavy American guns. Z.18 & cupola with two R105's and Z.10 and its cupola. I think that this is the plan of the lower bunker with the ability to fire into the moat or up the outer fort wall. The damage is excessive on this side showing where the Americans sighted their guns. The fort was bombed, machine gunned, Napalmed and shelled and then it took an infantry assault to capture it.